When Google first launched a website two years ago that collects data on solar rooftops, called Project Sunroof, it only covered a few cities. But this week, the search engine giant announced the solar site is now crunching data for every single U.S. state, including 60 million rooftops across the country. 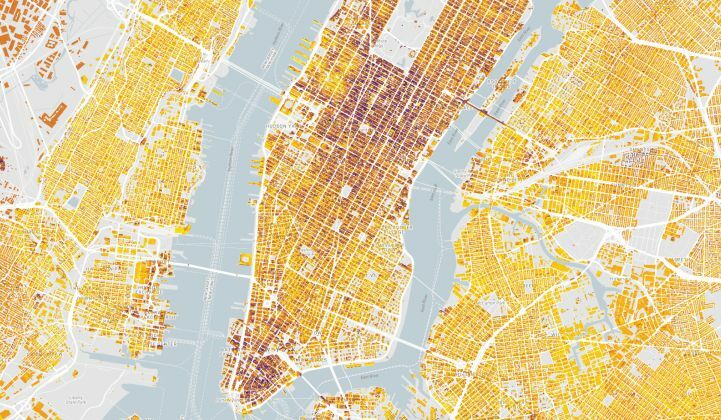 The expansion means that Google’s Project Sunroof is starting to get a much clearer picture of how much rooftop solar capacity there actually is in the U.S. Project Sunroof uses data from Google Maps and Google Earth, combined with 3-D modeling and machine learning to determine the solar electricity potential of individual roofs. Potential solar customers -- or just the solar-curious -- can enter their addresses into the site and get information about how much a solar system on their roof might cost and how much money they might save over time by going solar. The large amount of data being collected by Google also means that the internet company’s project could be a helpful tool not only for consumers interested in solar, but also for solar companies looking to bring in new customers, as well as academic researchers and even utilities. Now that Project Sunroof's availability is countrywide, Google’s amassed data has started to reveal some interesting trends and information. For one thing, Google says that 79 percent of the rooftops it’s analyzed are viable for solar, which is good news for rooftop solar providers. That doesn’t mean that 79 percent of rooftops should or will adopt solar, though. Rather, it means that 79 percent technically get enough sun to be able to accommodate solar panels. That finding is likely a generous interpretation of the data. For comparison (though it’s not apples-to-apples), a National Renewable Energy Laboratory analysis from January 2016 -- arguably the best technical analysis to date -- found that the rooftop space on all buildings in the U.S. could generate about 39 percent of total national electricity sales. The NREL report, which uses data from lidar and software modeling, also found that a sunny state like California could generate 74 percent of the electricity sold by utilities in the state. Solar industry watchers know that sun potential is only a part of the equation for when a customer decides to go solar. Other major factors include state renewable energy targets, net metering rates, tax credits and available financing. While keeping that in mind, Project Sunroof still plays a role in exploring the upper end of what’s possible. Google’s Conkling says Project Sunroof is specifically meant to report on the technical potential of solar. Google does include economic data in its solar price quote for users based on address and ZIP code. But Project Sunroof does not offer a comprehensive view of the rooftop solar market. When it comes to super-sunny states, like Hawaii, Arizona, New Mexico and Nevada, 90 percent of rooftops are viable, according to Google. States like Pennsylvania, Maine and Minnesota have just slightly more than 60 percent viability. The mention of Nevada’s blockbuster solar potential could be a kick in the gut for solar companies that were once operating robust rooftop PV businesses in the state. Those companies left Nevada after utility regulators changed the rates and fees for solar customers, making it far less economical. SolarCity saw its Nevada solar roof business fall off a cliff in 2016 after the policy change. Hawaii, which has a state goal to have 100 percent clean energy by 2045, has also been growing its number of solar roofs at a rapid clip. However, in 2015, the state also changed its rate structure, leading to slower rooftop solar growth since then. 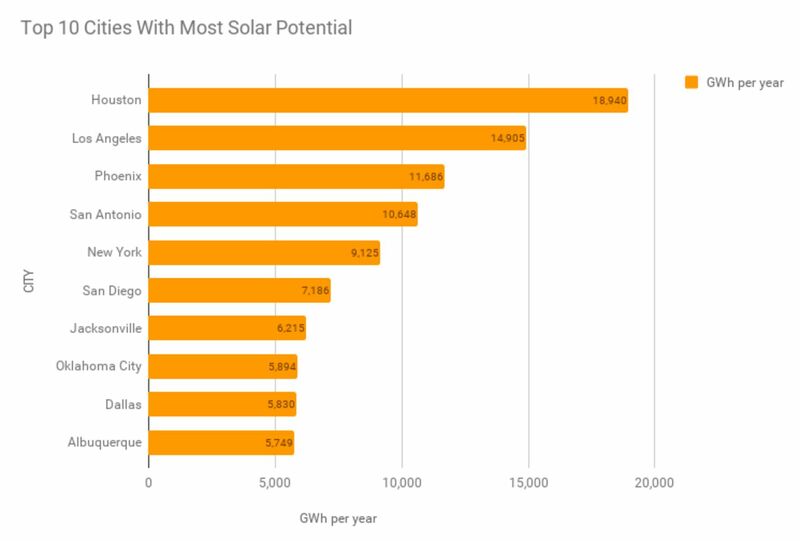 The city with the most solar potential is Houston, Texas, says Google, with an opportunity to generate close to 19 gigawatt-hours of electricity from solar rooftops per year. Houston, of course, already hosts a huge energy industry presence of oil and gas, and Texas has the largest wind energy industry in the U.S. Perhaps rooftop solar could take off there, too. There are only two California locations on Google’s top 10 list of cities with the most solar potential -- Los Angeles and San Diego. California currently accounts for a large portion of all the installed solar in the U.S. on both rooftops and in those sprawling utility-scale ground deployments. Google says that if these top 10 cities were able to reach their potential, they would be able to generate enough electricity to power 8 million homes. So what’s holding these cities back? Likely a mix of policy, economics and financing, as well as a lack of information, education and interest. The big nationwide solar companies have been spending exorbitant amounts of money marketing to customers and trying to close solar deals, which can be difficult. SolarCity plans to cut those costs a lot this year after its acquisition by Tesla, which is a nationally known brand and led by tech celebrity Elon Musk. Project Sunroof can help with the marketing process by sending leads to solar installers like Vivint Solar, SolarCity and Sunrun. Google’s Conkling says that Google doesn’t currently make any money on generating leads for these companies and at this point has no plans to make Project Sunroof more commercially oriented. But like all data-based models, Google’s methodology seems to have some limitations. Google's aerial imagery is used to estimate the solar potential, but, as Google admits, that data is not always entirely precise or up-to-date. Newer buildings may not be included, and large building-like objects, like bridges, could be mistakenly included. Some roof obstacles like vents are also too small to be seen by the satellite image data, says Google. The biggest limitation of the model is that it doesn’t include economic factors in its overall solar comparison (it does in its individual price estimates). Solar is highly dependent on a variety of factors beyond just how much sun falls on a roof. Conkling says Project Sunroof is meant to be just one part of the equation about solar data.